It’s time of the year again, tempers blowing up, social network rants increase, beefs increase, can you sense it? 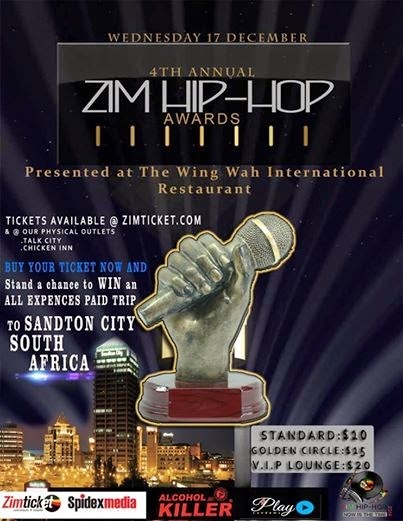 Yes, this has become an all too familiar environment for the Zim Hip-Hop Awards. It always is surrounded with some controversy of sorts. From fake views, #HatipfekeMabeads to being manhandled in clubs it’s always action-packed. Without further ado let us dissect the categories, shall we? This award, for me is basically a sum up off other categories. My prediction would be that Noble Stylz will take this one home, having appeared 5 times on the nomination list. He has also made himself very visible. Only other person I see taking this is Schingy, we all know why……. This one is an obvious no-brainer, Trae Yung takes this one, got us all singing #Ndikoko. Never heard of Misty and I last heard anything from Dice a decade ago. At least MK47 put out something this year. Obviously I’d pick my favourite for this one but putting all factors into consideration Ndamutswa (REMIX) will take this one. Not really sure how they describe this category but “Masofa Panze”. Errrr I assumed Best Promoter included those that promoted events/shows. I’ll have to put my money on either Plot Mhako or Prometheus for this one. Plot because he’s holding down the b-boy element of Hip-Hop and Prometheus has been been trying to put spotlight on upcoming rappers through his Saturday Zim Hip-Hop Report Show and his Rap Cities series of mixtapes. Doesn’t Bryce only promote his imprint Bryce Nation Music? Someone please enlighten me on who Mark Vusani is. Does he have an A.K.A? Hmmmm Marc Vusani we meet again! Is this the best club DJ supporting Zim Hip-Hop or just playing it? Another fuzzy one here. Not a clubaholic (yes, I just created that word) . We all Raydizz on Hamuko right? He dropped one or two of his own tracks. If that’s not support I don’t know what is. Never heard Lil Megaz material but this seems like a war between Ill Ceey (now known by his government name Courtney Antipas) and Mudiwa. 3 Mob only seems to cover Zim Hip-Hop from a single area (more than likely the North Samora area) plus it is not a predominantly hip-hop site. AHHB falls into the same bracket as 3-mob except that this IS a predominantly Hip-Hop site. I’ve been a constant follower of it since it was still called 25toLyf. Recently saw my young bro Sharky get featured on it but yeah, we all know where their loyalty lies. The criteria used for this category, lord knows. Are they accredited? More power to whoever wins. I won’t even predict this one. Blackbird’s vid was dope but does it fit in the stipulated period? It may be a year too late. Im throw the dice here and say that P.O.Y should get it. Mamonya (Ma1) has to be Song of the Year, cemented by the Ba Shupi feature and Simba Tagz production. Tambisa comes in a close second. Gosh! Speaking my mind on all these categories is actually hard work. Producer of the year? Hmmmmm this is a tough one. For answers we’d have to look into Best Female, Best Male, Best Collaboration, Best Album. If the awards are fair, DJ Krimz Beatz takes this one home (hopefully no backstage repossession shananigans like the ZIMA ones). I know none the participants of the following categories so I'm just gon list them.